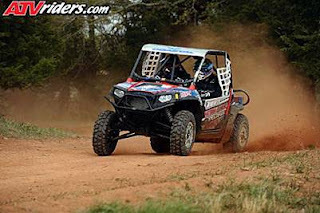 National Guard Polaris Coastal DragonFire Yokley Racing Team driver William Yokley finished 1st Overall and 1st in the Side by Side Open Modified Class, and National Guard Polaris Coastal Yokley Racing Team driver Scott Kiger finished 2nd Overall, capping a successful day for the team. There were 50 total entries with 29 Open Modified teams in the race today. 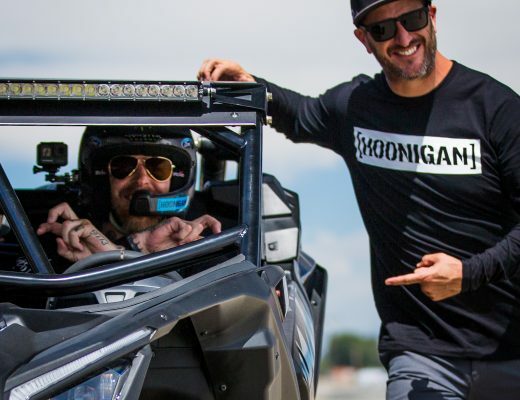 William’s guest passenger was his wife Tina, and Scott’s passenger was his mechanic, Joe Waligora. The Big Buck is a popular stop on the GNCC schedule every year, and great weather greeted the racers with sunshine and temps in the 80’s. The Polaris Yokley Side by Side Team has continued to refine the new RZR XP-900 for GNCC racing. Actually, the team runs many stock parts including the motor in this top-level cross country race series. William Yokley started on row 1 because he is the series points leader, and Scott Kiger started in row 4. When the starter’s flag dropped, William battled with Daryl Rath for the first few turns, and then slipped ahead as they headed into the woods. He had clear sailing for the first couple of laps until he ran into lappers. 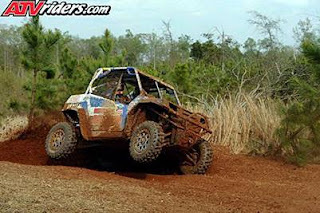 The RZR was handling and working very well, and he was able to extend his lead to more than 4 minutes at the finish. The track was fast with a few dusty areas. Scott Kiger, on the other hand, had his work cut out for him, starting behind so many other machines. He tried to be patient, but had to be aggressive at the same time. He move up to 5th after lap 1, then 4th on lap 2, and then was 2nd on lap 3 until the finish. He noticed his front bumper flapping up and down in front of him on the last lap. When he finished and examined it, the mounts were broken off and the winch cable was the only thing holding it on. So much for being patient! William still leads the GNCC season points, and Scott has moved up, tied for 2nd. The next race for the team is the WORCS event at Cahuilla Creek Raceway in Anza, California on April 23. Before that, the team hauler will provide a display area for the National Guard at the annual Thunder over Louisville KY festivities. The 90 foot hauler makes for a large area to showcase the RZR XP-900 race machines as well as other Polaris ATVs. The display will compliment the other military equipment and helicopters for this one day aircraft and fireworks show. Last year, more than 700,000 people attended this event. We will keep you informed and thanks for your support and interest in Yokley Racing.